Available at Ladbrokes Casino is the hugely interactive, thoroughly enjoyable and potentially very rewarding online fruit machine: Alien Cash Attack. Reminiscent of a traditional pub fruit machine, Alien Cash Attack has 3-reels and a single payline allowing players to bet from anything between 10p and £10. 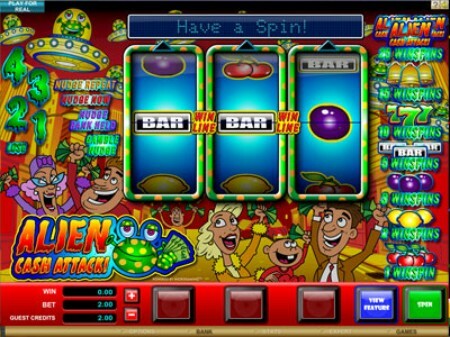 Developed and powered by Microgaming, Alien Cash Attack is quite unique in that in the regular game you do not win cash for hitting a winning combination but instead win free spins, or in this game ‘Win Spins’. Once at least one Win Spin has been claimed from the regular game a new window will open where players are presented with a 3-reel, 5-win line machine. Once here the game will automatically use up your accumulated Win Spins one-by-one and you win cash depending on the symbols displayed and their corresponding multiplier value. There is some serious cash to be claimed here with the multiplier values ranging from 1x for three Galaxy Swirl symbols and 500x for three Alien Cash Attack logos. If you like fruit machines with bonus features, make sure you try Rainbow Riches, or £500 jackpot fruit machines. Alien Cash Attack is certainly pretty unique and a lot of fun to play. You can play the Alien Cash Attack fruit machine game for free or for hard cash at Ladbrokes or 32 Red casino and take advantage of some of the attractive sign-up bonuses on offer.